Brazil is becoming one of majors aquaculture producers in worldwide, with significant advantages including the coastline of 8,500 km, 12% of the world’s freshwater reserves, tropical and subtropical climate and grain resources necessary. Moreover, technical assistance and technology development to support Brazil modern fish culture is growing. Thereby, Brazil has the enormous potential to become a prominent aquaculture player. In Brazil aquaculture, Tilapia and Shrimp farming are the most common. Here we will briefly introduce them. Tilapia is now the most popular aquaculture species in Brazil, accounting for 40% of all fin fish cultured in Brazil, exceeding 150,000 t in 2010, growing at a rate of 14% per year. Due to high density cage culture in the larger water bodies combined with monosex culture, improved locally produced feed and a far greater awareness of tilapia as an excellent food source, Tilapia production in Brazil is expected to grow even faster in the short term. Brazil’s shrimp farming has a history of high productivity. 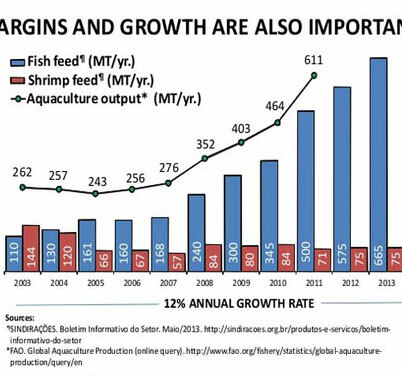 Shrimp farming grew rapidly from the late 1990s to 2003. And Shrimp production in Brazil reached 80,000 t in 2010 in an area of 18,500 hectares with 98% of the production consumed domestically, compared with only 22% in 2003. In 2014, Brazil produced approximately 90,000 metric tons of farmed shrimp. Shrimp farming will continue to expand in Brazil. As the aquaculture industry grows in Brazil, so does the aquafeed industry. Brazil is the second aquafeed producer in Latin American, and the largest one is Chile. Ecuador is the number one shrimp feed producer in the region, with approximately 3.2 million metric tons of shrimp feed per year. In the past, Mexico ranked second, but now, Brazil is producing more. Brazil is a significant global producer of grains and livestock, which is beneficial to aquafeed industry. These local commodities such as soybean meal, corn and rendered animal by-products can supply the necessary protein sources the aquafeed production require. As the vast grain producer with the large potential for further growth, Brazil owns the advantage in producing aquafeed that consists of around 50% of the total cost of aquaculture. For commercial aquaculture, fish and shrimp are both fed on industrially compounded feeds. Aquafeed generally constitute 40-50% of the total production costs in aquaculture, so people tend to make aquafeed for farming to enhance farming productivity and lower the cost. Furthermore, aquatic feed have superior water stability, better floating property and a higher energy than normal diets, which contributes to the increase in fish growth and improvement in feed conversion. Fishmeal is a rich source of high quality protein, has relatively high-energy content and is endowed with important minerals such as phosphorus, B vitamins and essential fatty acids. Fish oil can provide essential fatty acids required by shrimp. The wheat, having high gluten content, is often utilized as a binder in shrimp and prawn feeds and a carbohydrate source. 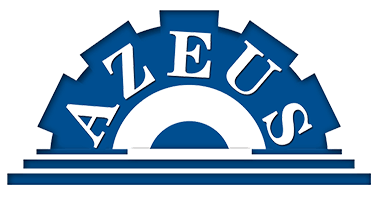 Aqua feeds require a minimum of 20 percent starch from cereal grains to enhance water stability. It is a major protein source for commercial feeds. Soybean meal with hulls (44 percent crude protein) and dehulled soybean meal (48 percent crude protein) are available in large quantities. These products are used in shrimp and prawn feeds. Vitamin and mineral premixes are generally added to shrimp feeds. Tilapia feed formulation mainly contains the following ingredients: bran chaff feed, oil cake feed, amphibious plant feed, pomace feed and Cereal feed, animal feed and compound feed. For detailed information, please read this article-Tilapia Feed Formulation and Feeding Technique which introduce Tilapia feed formulation in detail. 1. Grinding: Generally raw materials are crushed into powders by fish feed hammer mill to increase the contact area between feed, improve the digestive absorption of substance, nitrogen and energy and reduce the feed coefficient. 2. Mixing: various ingredients will be mixed in fish feed mixer. Even mixing will contribute to uniform distribution of different nutrients in aquafeed. 3. Extrusion by fish feed extruder: under the pressure-tight condition, material in high temperature will be formed into pellets by shaping mould. 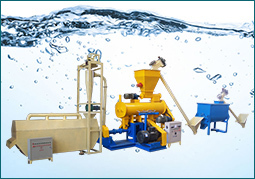 Dry type feed extruder is popular in aquafeed production. 4. 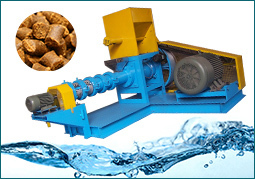 Drying: Final pellets from fish feed extruder are moist in high temperature, so use pellet dryer to remove moist and heat. 5. 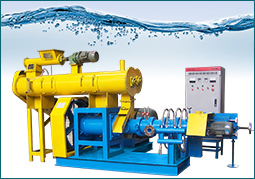 Spraying and Cooling: using spraying machine for pellets’ better smell and taste and by cooling pellets can be harden.